Have you ever felt your ears become hot? What does it mean when your ear gets hot? Maybe it happened as a result of feeling frustrated or mad. Hot ears are a harmless natural phenomenon with emotions, but it can also happen in association with a health condition or from an external source. To determine if red, hot ears indicate you need treatment, we will look at the causes to answer the common questions, “Why do my ears get hot?” as well as “Why are my ears burning?” and “Why do my ears burn?” These questions can also be answered with knowing the possible accompanying symptoms of hot ears. The embarrassment of having red ears plagues many people from time to time, especially those with very fair and light skin tones. 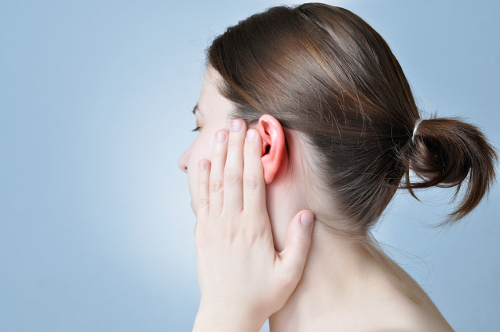 We have outlined some of the causes of hot ears and noted related symptoms. Our emotions play a big part in visible changes to our physique, such as the appearance of hot ears. It is common to see this with feelings of embarrassment, anger, and fear as our body releases adrenaline and noradrenaline in reaction to these emotions. These can cause an inner reaction of vasodilation. It will result in a rapid pulse, and an increase in heart rate as the blood vessels open wide. On the outer body, the face will become flushed and warm to the touch and will spread to the ears, which may appear red and hot. Our ears have constant exposure to various environmental factors that can have a short-term or lasting effect on them, which include temperature, chemicals, and weather. Cool or cold temperatures, or the wind, can cause a freezing effect on the skin of the ears, causing them to turn red. The same is true for extreme heat temperatures and exposure to ultraviolet rays of the sun. Along with redness, your ears may be painful to the touch with skin conditions including a rash, dryness, itchiness, peeling, or blisters or bumps. As our body experiences internal changes and the aging process, it can produce hormones that affect our external appearance. The release of certain hormones can result in hot ears. For example, problems with the hormone levels in thyroid conditions can lead to itchy, red, and hot ears. A similar outcome is seen with adrenal fatigue when the adrenal glands fail to produce sufficient amounts of the adrenaline hormone. Red and hot ears, weight loss, a drop in blood pressure, and kidney failure can be brought about by this condition. The hormone changes during menopause may also produce hot ears symptoms. The treatment for many medical conditions such as angina, diabetes, high blood pressure, and cancer can also result in hot ears. These may be the unwanted side effects of medications, but it is a small price to pay to avoid further complications of the health condition. Many of these medications cause hot ear symptoms when combined with alcohol. Red ear syndrome is a rare medical condition that causes one or both ears to become red in color with pain and a hot, burning sensation. The symptoms can appear for a short time or for a lasting time, and can occur once or several times a day, or every so often. It can happen at any time for no specific reason, or can be stimulated by internal and external factors. These vary from patient to patient and can include coughing, sneezing, eating, turning of the head, and exposure to changing temperatures. There are health conditions that may contribute to red ear syndrome such as migraines, joint diseases, and spine disorders. There are other health conditions linked to inflammation or the effects of the blood vessels causing red hot ears. This symptom can also be brought on by extreme physical activity, allergies, and exhaustion. The only way to treat red, hot ears is to determine the cause and start from there. If your ears are exposed to cold or hot temperatures, or windy weather conditions, time will heal your symptoms once you are out of the elements for a time. Any redness from hormone changes may also dissipate over time or treated with hormonal therapy. Red, hot ears caused by medical conditions may be addressed through the appropriate disorder treatment. If your emotions are ever-changing and you are constantly suffering from red ears, counseling to deal with the underlying stress and issues may help to curb the episodes. So, why do ears get hot? As previously mentioned, in some cases, prevention of the hot ear symptom begins with avoiding triggers. When venturing out in extreme temperatures, protect your ears accordingly by using sunscreen and wearing a hat when in the sun, and also by covering your ears fully when in cold temperatures. For some people, it may help to maintain a healthy diet of whole grains, fruits, vegetables, nuts, fish, and other foods enriched in omega-3 fatty acids. Regular exercise and staying hydrated are important tools for good health. Red and hot ears can cause embarrassment and in some cases, pain, for sufferers. This condition can be the result of external factors or even as a side effect of a serious medical condition. Knowing the reason behind the symptom is half the battle, as hot ears can be associated with other symptoms. Treatment and prevention of this condition highly depend on the cause, but there are key steps to follow that may allow you to avoid it. Lietz, J., “Why Do My Ears Feel Hot?” Livestrong, August 16, 2013; http://www.livestrong.com/article/322799-why-do-my-ears-feel-hot/, last accessed April 12, 2017. Borreli, L., “”Listen to This: 5 Things Your Ears Can Tell You About Your Health,” Medical Daily, October 28, 2014; http://www.medicaldaily.com/listen-5-things-your-ears-can-tell-you-about-your-health-308078, last accessed April 12, 2017.